The New African Woman is changing the face of women’s publications with insightful, hard-hitting and edgy stories, which generates hot debates among its readers and of course, the good, the bad and ugly reactions. Nevertheless, Regina Jere-Malanda is unbowed and with each edition, raises the bar. She has done it again with NAW’s latest edition. NAW has been going for over a year, yet, it has achieved the visibility and credibility that would take others years. That is not to say NAW has become complacent and believes it has arrived. In fact, it is the exact opposite as the aim is to always do better and so, NAW and Jere-Malanda always welcome your comments, criticisms and feedback as she strives to continuously bring you the very best where journalism is concerned. 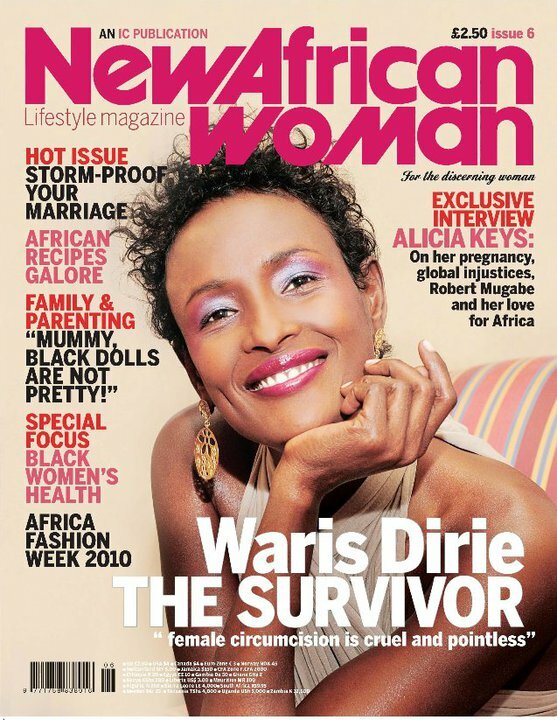 NAW’s sixth edition has the indomitable Waris Dirie on the cover with a moving and poignant story about Female Genital Mutilation. As for the content of the entire magazine, you are spoilt for choice. From an exclusive interview with Alicia Keys as she talks about her love for Africa to the subject of marriage as NAW discusses ways in which you can storm proof your marriage, to eye candy images from the Africa Fashion Week, Johannesburg, to women who are trailblazing in politics and business, to NAW’s first in-depth women’s health coverage. You do not want to miss the health features; they expose and examine areas we are shy to talk about while giving informative ideas and actions you can take in order to stay healthy. And my world the food and drink section is sizzling with Chef Ola, a new addition to the NAW family and of course, NAW is always keen to bring the readers great art and culture news with its selection of summer’s must-read books with the likes of Lola Shoneyin and her debut novel, The Secret Lives of Baba Segi’s Wives, The Long Song by Andrea Levy and The Memory of Love by Aminatta Forna. It is fair to ask, what more could you ask for in a magazine, which NAW has not covered with its summer edition? A job very well done by its big-hearted super-editor, whose aim is to shed light on women’s issues no matter how challenging the topic. So, enjoy browsing and above all, enjoy reading! You will not be disappointed. Whatever you do, make sure you get this edition, go on, get a move on…get to your nearest WH Smith on wednesday and your local vendor. What are you waiting for? Come on, get a move on!! The New African Woman is sold at selected UK WH Smiths and is available nation-wide from wednesday and globally a fortnight later. However, you could always go the one better and try the digital version available online using the link below – including a free…trial and access to all back issues of the New African Woman. To view all issues just click the New African Woman tab. This entry was posted on Wednesday, July 21st, 2010 at 11:09 pm	and is filed under Africa, Journalism. You can follow any responses to this entry through the RSS 2.0 feed. You can leave a response, or trackback from your own site. Could you save me a copy please, I’m away and I’m unsure of whether or not I’ll be able to find a copy when I get back.